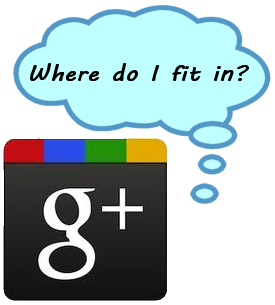 Home » Social Media Opinion » Can Google+ Become Your "Default" Social Media Outlet? Can Google+ Become Your "Default" Social Media Outlet? The overwhelming opinion from those who chimed in was that right now brands and businesses have nothing to fear, because while Facebook has made a lot of changes that have ticked off its user base, the growth of that user base shows no sign of letting up. What all of us in the discussion also agreed upon is that it will be very interesting to see Google+’s options for businesses and brands. Those are due to be unveiled later this year. In a roundabout way, this discussion led me to think about how Google+ can grow and become the default social media outlet for more people. Right now, most people I know spend more time at Facebook and/or Twitter, and if they visit Google+, they do so as a secondary or even tertiary outlet. I’m going use sweeping generalizations here, so bear with me, but I view Twitter users as people who want to find and share news and short opinions. Facebook, meanwhile, can be used for similar purposes, but is also a place to see what your friends (and their kids .. grandkids .. etc.) are up to. If I want to find news about something going on right now, I go to Twitter. If I want to see pictures from last night’s neighborhood event (bad example, I know) then I go to Facebook. So … when do people go to Google+? It’s hard to answer that question. Google just opened the service to the general public (no invite required) this week. Until that day, the site was a haven for techies. Few people who weren’t connected somewhat in the social media world had managed to swing an invite, or cared to go through the trouble of getting one. As a result of that closed user base, the site has until now been a great place to find news about social media and technology, as that’s what people were sharing. I have never once seen a post on there with pictures of someone’s new cat. I view Google+ as being in between Facebook and Twitter in what it does. You can read posts from whomever you want without being invited, something Twitter has always been identified with but Facebook just implemented. On Google+, however, you’re not limited in character count and can post images … like Facebook. Being an in between service isn’t enough, though. Right now, what will do the trick is still up in the air, as the site is still evolving. What is clear is that Google+ needs to find its niche, and it needs to do it soon before the public forgets about it. to become the default social media site? I’d love to hear your opinions in comments. Thanks for carrying forward the conversation. It seems that FB has examined Google+’s potential and is trying to proactively position itself to stem that off. Could it be that ham-fisted action on FB’s part that creates the opening for G+? Hard to say. But it is clear that a significant segment of Facebook tolerates it without loving it and those people would seem to be a juicy target for any network that can offer a friendlier and more stable experience. I think the tipping point will be when G+ opens up for businesses because that will signal a transition to possible mainstream appeal. Right now it’s a nice place to post comments, pictures and videos to tiered circles but at the end of the day Facebook has proven that people want more than that. They want to play games, enter contests, give and get direct feedback from brands, celebrities and athletes that G+ has not delivered to date. Thanks for the input, Jeff and Jon. I agree with Jon that G+ opening for businesses and brands will be significant. I just don’t know that it will be enough to get more “regular people” there. I think we’ve seen the potential of Twitter in multiple breaking news situations (most notably the controlled landing of a jet in the Hudson River a couple of years ago) and we know what Facebook can do in terms of connecting with old and new friends, but what can Google+ do that the other two can’t? From what I am seeing, G+ is getting the members, but not the participation. I see a lot of people complaining about the new Facebook changes, but they are complaining ON Facebook. I figure either they will eventually learn all the new features and go back to enjoying Facebook (leaving G+ in the dust), continue using Facebook and ignore many of the new features, or eventually get tired of trying to make Facebook work the way they want and defect to G+. Either way, I don’t see G+ drawing a crowd on its own. Not yet. Its biggest advantage is how clean it is. G+ is like reading a newspaper compared to the Used Cars TV Ads approach that Facebook is offering. I, for one, got tired of the shouting and have moved to G+. I still check Facebook, but no longer use it as my primary social media site. Well said, Josh. I suspect that most people will stick with the clutter of Facebook, for good or bad.